Who doesn’t love to throw a dinner party, but some just do it with a little less stress. •Write out your menu and plan out your prep day by day, preparing as much as you can in advance and picking recipes that can be finished at the last minute. •Have each one of your guests help with a different dish when it comes time to serve it. They’ll have fun and it will take some stress off of you! Start with Creamy Roasted Parsnip Soup with Chevre and Walnut Crostini. The soup can be made ahead and then just finished off before you serve. Next, a salad of arugula and brilliant radicchio tossed simply with balsamic and olive oil sprinkled with pomegranate seeds. Then move on to an entrée of oven-roasted Spiced Chicken with Pears and Port. It slow cooks while you are mingling with guests. 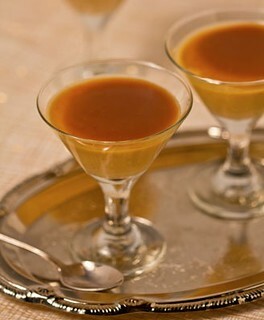 Then finish with Pumpkin Panna Cotta with Holiday Ale Caramel – this can be made a week before. Gotta love that! Mini Pumpkin Panna Cottas with Holiday Ale Caramel Sauce – d’lish to the last spoonful! Toss parsnips and olive oil together in a bowl to coat evenly. Spread out on a baking sheet (you can reuse the one used for the bread), and roast till golden and totally tender, about 30 minutes. Return soup to pan and adjust seasoning if needed. Cool and refrigerate for up to 3 days before serving. Spread the cheese on the croutons, then top each one with a half-tablespoon of nuts. Press in slightly and bake for about 4 minutes or until cheese is warmed. Meanwhile, heat the soup, stirring often, over medium heat till hot, making sure it does not stick on the bottom. Serve the hot soup in warm bowls. Top with chives or celery leaf and serve a warm goat cheese crouton on the side. Recipe© Kathy Casey Food Studios®. You can make the panna cotta up to 5 days in advance—just keep tightly wrapped with plastic. The caramel sauce can also be prepared up to a week beforehand, making it the perfect dessert for a busy holiday schedule. In a small, microwave-safe bowl, sprinkle the gelatin over the water. Soak until the gelatin is soft, then microwave on high power for only about 2 seconds, or until the gelatin is melted but not foaming up. In a large mixing bowl, combine the cream, sugar, sour cream, mascarpone, pumpkin, vanilla, and spices. Add the gelatin and whisk together well. Place the mixing bowl over a pan of simmering water, being sure the bottom of the bowl does not touch the water. Cook the mixture, whisking constantly, until smooth and hot (150 to 160 degrees F on an instant-read thermometer). Remove from the heat and divide the mixture evenly among 8 regular or 16 mini martini glasses (or 8 custard or 16 espresso cups). Cover with plastic wrap, making sure the plastic does not touch the panna cotta. Refrigerate for a minimum of 12 hours to set. To serve: Drizzle each panna cotta with ale caramel sauce (1 tablespoon for the minis or 2 for the larger portions), and then sprinkle lightly with sea salt. Chef’s note: If making the ale caramel sauce is too much for your schedule, then substitute with a speed scratch sea salt caramel sauce; mix 1/2 cup purchased high-quality caramel sauce with 1/4 – 1/2 teaspoon sea salt, depending upon how salty you like it. If made ahead, cool completely and store refrigerated. Bring to room temperature to serve. The recipe makes more than you’ll need for the panna cotta; extra sauce can be drizzled on ice cream, pound cake or other desserts. In a medium-large saucepan, bring the ale to a low boil. Cook, uncovered, stirring occasionally, until reduced to 1/2 cup. Remove from heat, add the brown sugar and stir to dissolve. Bring mixture to a boil and cook without stirring (stir or swirl the pan only if necessary to prevent boiling over) for about 10 to 15 minutes, until thick and syrupy (about 230 degrees F on a candy thermometer). Remove from heat and slowly whisk in the cream and butter (it may splatter! ), and then cook for 5 to 6 minutes more, until thickened. Remove from heat and stir in the vanilla. If serving right away, cool until just warm; it will thicken up more as it cools. Keep refrigerated for up to 2 weeks. Bring to room temperature before serving. “Over 21” Real Fruit Cakes are back for the holidays! ‘Tis the season once again where the Food Studios elves will be busy chopping nuts and soaking loads of fruit in bourbon … to make our annual holiday-inspired “Over 21” Real Fruit Cake made with Maker’s Mark! These REAL fruit cakes are full of Maker’s Mark-soaked dried fruits, including apricots, cranberries, tart cherries and golden raisins as well as loads of nuts from toasted hazelnuts to rich pecans – all bound with my signature spiced batter. Baked then brushed hot out of the oven with a Maker’s Mark bourbon- brown sugar glaze. Who’s ready for a slice of “Over 21” Real Fruit Cakes made with Maker’s Mark? 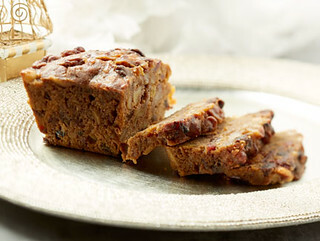 “This is not your grandma’s fruitcake and has over the years now gained a cult following. Chock full of Maker’s Mark bourbon-soaked real fruits and toasted nuts it’s sure to convert any fruitcake naysayers. It’s hard not to eat the whole thing!” commented Kathy Casey. Monday thru Friday, 9:00am – 5:00pm. •	Order from our website starting November 23rd while supplies last. •	Our festive loaves are priced at $11.95 this holiday season – supplies are limited, as they sell out fast! Watch our YouTube video to see deliciousness in the making! Kathy Casey Food Studios is located at 5130 Ballard Ave. NW and is open Monday through Friday from 9am to 5pm. (We suggest calling ahead to be sure that cakes are available). During Food Studios hours, there is available parking in the back lot. For more information, contact: call (206) 784-7840, email dishing@kathycasey.com or check out our website www.kathycasey.com. Often the trick to a d’lish dish is the sauce, but sometimes making one can be a bit daunting. 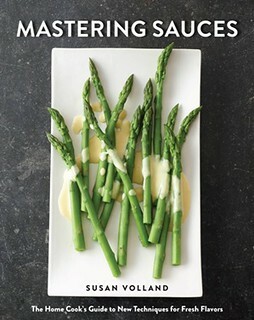 Seattle author Susan Volland’s new book Mastering Sauces: The Home Cook’s Guide to New Techniques for Fresh Flavors will help take the mystery out of making a great sauce. So you can easily splash, slather, drizzle or douse! From basic recipes for stock (the building block of sauces) to creative and unique takes on classic recipes, this book has sauces covered from A to Z. From quick and easy Stir-Together Peanut Butter-Hoisin Dipping Sauce to her recipe for a Vegan Corn “Hollandaise” – there are a lot of ideas to finish off your favorite dish. Susan is an amazing chef and has wanted to write this book for years. It is one of the most comprehensive sauce books of all times and destined to become an eternal classic. Her recipes are always well written and precision tested. So crack open a copy of Mastering Sauces and get saucy! Whisk together all of the ingredients in a small bowl. Taste and adjust the seasoning. Serve the sauce at room temperature or lightly warmed. If storing, cover and refrigerate for up to 2 weeks. Recipe from Susan Volland’s Mastering Sauces: The Home Cook’s Guide to New Techniques for Fresh Flavors, W. W. Norton & Co. Combine the water, corn kernels, and cashews in a saucepan, cover, and simmer until the cashews are tender and the corn is very soft, about 20 minutes. Cool slightly. Transfer the cashew mixture to a blender, add the miso, yeast, and arrowroot, and puree until very smooth. Strain back into the saucepan, pressing the solids against the sides of the strainer to extract as much smooth pupl and liquid as possible. Heat the sauce over medium heat, stirring constantly, until it is just simmering and has thickened. Season with the lemon juice, salt, and cayenne. Serve warm. Unlike hollandaise, this sauce can be refrigerated and reheated. Cover and refrigerate for up to 5 days. Earlier this summer the Fairmont Global mixology team visited Liquid Kitchen for a drink development workshop to create a new global cocktail menu – launching later this November. Check out Cheers Magazine for full coverage of the R&D session the Classics, Perfected menu, meet the Fairmont Tastemakers, and recipes for the Right Word and Pomegranate Paloma. Libatious article in Lux Worldwide on the Fairmont Hotels’ new global cocktail menu – Classics, Perfected developed at the Liquid Kitchen with the Fairmont Global mixology team. Check out the full article here and learn about the Fairmont Tastemakers’ creative process. Great write-up on the Fairmont Hotels & Resorts’ new cocktail program launching later in November. Here’s a sneak peak of the cocktails – developed at the Liquid Kitchen with the Fairmont Tastemakers team – (at last month’s media event at The Savoy). Check out London-Olios for the full post.